Terms like “Empire”, “Soverignty”, “Federation”, “Confederacy”, “Nation”, “Supremacy”, and “Kingdom” seemed oddly specific and out-of-place, and even seemed designed to evoke legitimacy by comparison with European state structures. Were these really accurate labels of the political systems? The number of different Native American nations seemed far too few; was the map aggregating them in some way I’d never seen before? The borderlines seemed too crisp; weren’t many of these peoples semi-nomadic? Glaringly, the Olmec were much earlier than the Aztec and Maya. What era was this supposed to be be representing? And the biggest red flag… there was no source for the data, no provenance for the map, and the label was truncated. So I dug into it, using TinEye to find the history of the image. We aren’t taught this map, because this map isn’t real. The reality is far more complicated, fortunately or unfortunately. It doesn’t lend itself to easy and obvious emotional appeals. Images and data visualizations make hard things easier to understand, and thus are extremely tempting to share. A lot of my friends have already shared this map; they’re smart, well-meaning people, and most of them are Liberals of some stripe or another. Before the week is out, this map will be shared many hundreds of thousands of times. Self-styled Right-Wingers, Conservatives, and Republicans are going to jump on this. They’ll point this out as typical knee-jerk America-hating Liberals, and laugh at the fact that people who consider themselves educated and intelligent were fooled by so obvious a hoax. Here’s where these Right-Wingers are wrong: the map is incorrect, but the sentiment and the facts informing that sentiment are correct. It’s easy to laugh at someone for being undereducated if your political party systematically suppresses the correct information that they should be getting from their schools. That said, we’re all responsible for our own truths, and before you put something out there in the world, or share something someone else has said, you should do some fact-checking. If what you’re saying is a matter of objective fact, rather than subjective opinion, it’s more important to be correct than to be heard, otherwise you might undermine your own valid message. But in this busy world, if you do make a mistake and spread something that you learn later was incorrect, don’t be so hard on yourself… just correct the record. We make mistakes, and it’s silly and mean-spirited to shame others for that, especially when their intentions are good; and worse yet, it forces people to defend themselves even if they were wrong, and doesn’t reinforce self-correction. 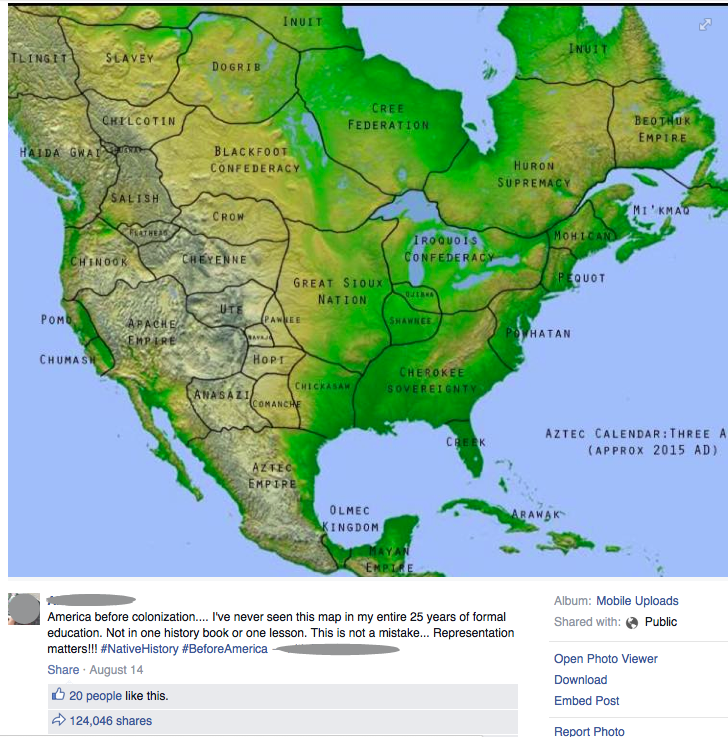 Megan, my spouse, casually shared the erroneous map, but when I pointed out the flaws, she corrected herself in her comments, frankly and openly; she didn’t delete the message, she enhanced and corrected it. This is the lesson we can carry forward from our own history as a nation: we have made mistakes, and we will continue to make mistakes, in how we treat others and how we think about our world; we need to remember these mistakes, and correct our behavior. We need to continue to make this a more perfect nation, knowing we will fail, but with good intentions. 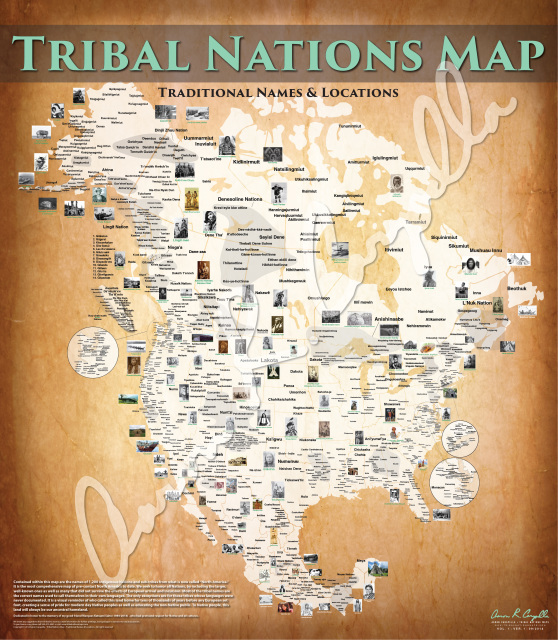 Megan also pointed me to a great NPR radio story about Aaron’s maps and the naming of tribes. You can support Aaron’s work by buying his maps (currently on sale). In the modern era, when it’s so easy for information to spread, it’s our social responsibility to spread factual information and to correct misinformation. It’s important that our technological tools make that easier, not harder; Facebook and Twitter don’t currently provide good tools for either of those tasks. 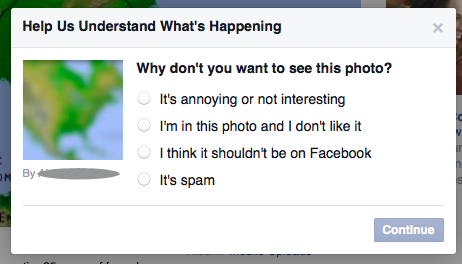 For example, Facebook’s “Report Photo” dialog contains only the options “It’s annoying or not interesting”, “I’m in this photo and I don’t like it”, “I think it shouldn’t be on Facebook”, and “It’s spam”; why can’t they include “It contains factual errors”? How can I politely tell someone that they have made a mistake if the tool doesn’t include a way to do so? I’m hopeful that the work of the W3C Web Annotation Working Group will yield a set of technologies and conforming services that make fact-checking and accountability possible through decentralized annotation. (If this intrigues you, check out Hypothes.is, a socially-conscious annotation service you can use today). If we want a civil society in a fast-paced, hyper-connected world, we are going to need to adapt our education system, our technological tools, our social norms, and ourselves. Samuel Cousins informed me on Twitter that the source of the map was a scifi and comic book writer, Joseph Abbott (aka liminalsoup), who posted the map on Reddit looking for feedback for a story they’re writing. I’d guessed it was probably source material for a role-playing game campaign, so I was a bit off base. Thank you for doing the research. The naming sounded too much like from a Star Trek episode indeed. I am not sure about the anti Right Wingers jibe. If thr map is not correct, then it’s not correct. To introduce sentiment is a form of pitying the Native Americans, and that’s not a way to respect them or their memory. You’re welcome. The research took only a few minutes; writing the blog post took much longer. I’m using the word sentiment in the sense of “an attitude or opinion”, not in the senses of “emotional idealism” or “a romantic or nostalgic feeling verging on sentimentality”; it’s not meant to convey any pity. That said, I do feel bad (and outraged) about what Europeans did to the native peoples, and how colonialism set the stage for many of today’s geopolitical problems. I think that trying not to repeat such mistakes of the past is an appropriate way to honor these peoples. Regarding the prediction about the Right Wing reaction, it’s not intended as a jibe. We’ll see in the coming days if I was sadly correct, or if I was happily too cynical. As to the map being not correct… in some sense, it doesn’t really matter, a notion I’d hoped I conveyed in my blog post. Whether the map lists only 38 names of Native American tribes and nations, or more accurately lists hundreds of them, the genocide was real. Omnologos, you don’t understand. Certainly the map is wrong. The fact that it purports to show North America in 2015 might have been a giveaway. It’s an alternate history map; some AH buffs work out timelines for what-ifs–what if the Nazis had won World War II, what if Christianity had never spread, and so forth–and some present what-if maps, which this one is. Anyone with even the scantiest knowledge of American Indian history would have known this the moment he looked at it. But lo! the poor Indian, and besides it gives progressives a chance to slam people who don’t agree with them. I’m not sure it’s totally obvious to the average American (and it wasn’t to me) what the problems with the map were; that there’s been so much traffic about this (both sharing and debunking) makes me think that it’s not as readily apparent as you suggest. I haven’t seen any progressives “slamming” people who don’t agree with them. The person who posted the map on Facebook didn’t say anything at all about disagreeing with anyone, just lamented that Native American history is not taught in schools. I predicted that self-identified Right-Wingers would take the opportunity to belittle people who shared the map while ignoring the underlying truth, and called it out when they did just that… not because they didn’t agree with me, but because of their “shaming”, which I think is corrosive. If that’s what you’re referring to, I wouldn’t consider any of that “slamming”; I didn’t call them names or anything. 😀 Perhaps we differ on what is “slamming” versus polite disagreement; I’ve been known to rub people the wrong way. Chris, thanks for sharing your blog post. Your instincts on when to dig deeper are admirable, and you had a better research methodology than me. In my opinion, your blog post stops short of looking at the deeper underlying message, at why this particular image captured people’s imagination, and at how a different approach could better fit the goals. To me, an increase in civility and respect is both compatible with and more desirable than the correction of details (however egregious the errors). Hi, John, thanks for posting the link to Caleb Howe’s blog post. I strongly support with Caleb’s assertion that our education system should prioritize attention to detail and critical thinking (which I don’t recall from when I was in school… but maybe I wasn’t paying attention). You seem to be pointing out a contradiction between a civil, respectful discourse and political disagreement; I don’t see how a civil society could function without a frank exchange of viewpoints. In fact, Caleb’s blog post (archived on Archive.org, in case the original changes) is a perfect illustration of the “shaming” approach that I’d anticipated would be the reaction from self-described Right-Wingers. Are you saying I’m uncivil or disrespectful because I correctly predicted the obvious reaction by Right-Wing partisans? I don’t know if Caleb read my post before writing theirs. Certainly, we used exactly the same sources: the Facebook and Reddit posts, obviously, since both are primary sources; but also NPR and Aaron Carapella’s maps; these were easily found, so it might be a coincidence. But we reached dramatically different conclusions, and if Caleb did read my blog post, they didn’t take the message to heart. Where I included an axiom of self-correction, suggestions for fact-checking, an anti-shaming philosophy, and acknowledgment of social injustice, Caleb leaned toward sarcasm and phrases like “Prepare to feel bad”, and “fails”, while downplaying the very real and historical systematic genocide of Native Americans and lack of education about with dismissive phrases like “racist conspiracy”. That’s really missing the forest for the trees. The Historical Atlas of Native Americans, & Joseph Campbell’s The Way of the Animal Powers both have a number of maps, especially of linguistic families. Just an uneducated, tired grandmother here. When I saw this post, I took it as a political cartoon– an amusing satyrical “translation” to colonizers terms for social constructs. As for “honoring their memory” it would seem to make more sense to honor the many treaties we continue to violate with the living Tribes. Juleta, thanks for sharing! That’s an interesting perspective, about the social construct “translation”; maybe that’s the level that this was working on, to get it shared so widely. Clearly, it touched some social nerve! And kudos on the concrete suggestion that we advocate for honoring our treaties with Native Americans! Canada is far ahead of the US in this regard, with how they respect the land rights of the First Nations (though it’s always a struggle there, too). Aaron’a map needs a date, in that the tribes weren’t static. Scholars generally agree that my own tribe, Cherokee, started out in the Great Lakes area, got their lips beat off by the Delaware and worked their way down to where Aaron’s map has them placed. Remember, even the tribes were immigrants. William, great point. I don’t know what date Aaron’s maps have, but I hope at least some of them (he has many) do have dates. I’d love to see a dynamic, interactive, animated map of different cultures (and languages) moving around the Earth throughout history… or rather, several such maps, because there will be different claims and evidence about when, where, whom, and why. I think something like that could really give schoolkids (and adults) some real perspective. Also… “got their lips beat off”… LOL, that’s a pretty vivid expression! I’m picturing the slo-mo boxing scenes in movies where the hero gets punched in the chops. This map has errors – it is about 5-15 times too simple and has errors in excess of 1000km. However, while this map shouldn’t appear in textbooks – the shocking thing is that people have seen so few similar maps that they can’t spot a totally inaccurate one from a real one. That is evidence of suppression of history. Oh, and all of First Nations / Indigenous groups had areas which they revisited regularly, seasonal camps, rules about land-use, and treaties to allow rights of passage or hunting on each other’s lands. The reason why they appear so ‘mobile’ is largely a result of destabilisation resulting from fur trade wars, disease and ethnic cleansing. Jonas, I agree. The details may be wrong (in fact, were intended to be fictional), but we Americans should have been exposed to the correct information. I grew up in Jefferson City, a town on the banks of the Missouri, but I don’t recall any significant effort in school to tie the history we read in books to the land we were living in… not even Lewis and Clarke, much less Sacagawea, the Osage, or any other Native American history or connection. Thanks for linking to the map, that looks like a good project, though it focuses mostly on Canada. I didn’t see any date information on it… am I missing something? Thanks for a helpful post! That map looked potentially useful, but set off my spidey senses. Fortunately, this was the first place google took me. Hi, Laura, thanks for visiting! Glad I could help. Thank you *so* much for this post, including research, factual map links, thoughtful opinion and suggestions for action steps. This map-loving educator of young children (infants through six years) deeply appreciates this work. I have been implementing an anti-bias philosophy/approach to materials, activities, and interactions for three decades – this is a wonderful addition to our resources. Andrea, I’m flattered. Nothing in the post was beyond plain common sense, with the exception of the technology-specific stuff that I know through my job, but I’m glad that you might find it useful. Thank you for taking the time to write this post. The minute I saw the photo of the map I knew something didn’t quite add up. Having grown up in Montana and having learned some of the history of the native people of that region, I knew there had to be more to this story. You’re welcome, Shawnmarie. I’m glad your knowledge of you local history gave you the insight to look deeper. If you’re looking for actual information on what tribes (and specifically their languages) look like today, the place to go is http://www.ethnologue.com/ It is accurate and detailed in the way that we all wish this map had been. Yeah, that’s a good resource… I own a copy of the Ethnologue book, it’s fascinating. There are many good resources out there that show the real distributions of Native American groups. I suspect that the simplicity and use of European state analog names was what set this one apart, to get so widely shared, along with the context of the quote about lost (or suppressed) knowledge. Thank you for a good article, BTW. Thank you for making people think. How about we have the government compile where they slaughtered everyone. I’m sure they have more record than anyone. Furthermore if the Confederate flag offends people, how bad the American flag offends most native people. Perhaps we should make a new flag called indigenous people. The American Indians are living in desert ghettos, the government has just poisoned their water and they are going to take more sacred land that was promised. It’s time to change up the government! Hi, Jim… it’s always time to change the government! That’s the whole point of having a democracy, that the people can change how the government works and who is administering it, toward an ever-better match for our ever-changing needs and wants. Recent changes to the government have not always been for the betterment of its citizens, including our aboriginal citizens, and I agree that we should reorient the government that way, toward more equal justice. Thanks for the link, Jared! That’s very detailed, and shows how complex the current situation is. Thanks, Reedstilt! I had that link, but linked instead to the user’s account. The direct link is indeed better, so I’ve replaced the one I had, in the Update at the end of the article. Ah, I see I missed the update where you included that information. Thanks, again. Also, since you metioned Snopes, did you see that they have an article about this as well? Hello everyone, whereas this map is an overview of some Nations and confederacies, it glosses over hundreds of smaller and not-so-small Peoples…my maps are not perfect, and are a work in progress, so I cannot be too hard on the creator of THIS map. People have asked what time period my maps reflect at http://www.tribalnationsmaps.com ,…these maps show the last homelands that each Nation defended in the time that they were free….this “year” is different for each Nation, but because some Nations were nomadic, and because European incursion pushed some Peoples around, it is hard to set a specific date to one map. I invite any feedback, and regularly make updates to make them as accurate as possible. Thanks! Hey, Aaron, I’m honored that you visited and commented on my site! Thanks for your hard work in creating accurate resources. I hope you and others who are creating great maps and information about Native peoples get some benefit from the increased awareness on social media. I don’t think the creator of this map would take offense, since it’s intended as part of a piece of fiction, and a self-styled rough draft at that. Hi Aaron, First of all I like your maps and appreciate all the work they represent. I shared them on Facebook before. I just shared Alan’s blog post also because it closely reflected what I didn’t take the time to say on Facebook. My family is Ojibwe/Anishiinabe from Northern Ontario, and our tribe was completely left off the map Alan writes about, displaced by something called the Huron Supremacy which I’d never heard of before, though there are references to a Huron Confederacy. I moderate a Dakota Facebook site for the Eastman (Ohiyesa) family and the members have complained that the Seven Council Fires (Lakota/Nakota/Dakota etc.) are not represented correctly on your map. Just passing along this info as an FYI, again admiring /recognizing your research and work. Given that the map itself says “AD 2015”, is it not clear that this is a fictional conjecture based on actual history? Seems clear that it’s meant to make a point but not be taken as a formal map. While the twitter post says “pre-colonization”, the map itself doesn’t. Not that anyone would put anything incorrect on twitter…. Yes, this disjoint between the map label and the what was said about it is probably one reason so many people are looking deeper into it. Hi, I love the discussion going on here. I do understand that it should be a conversation about the “indigenous” peoples and what could have happened. However, it has beem over 500 years since Europeans set foot on this continent and there is really no way to tell how it would have ended up had Europe not come over. 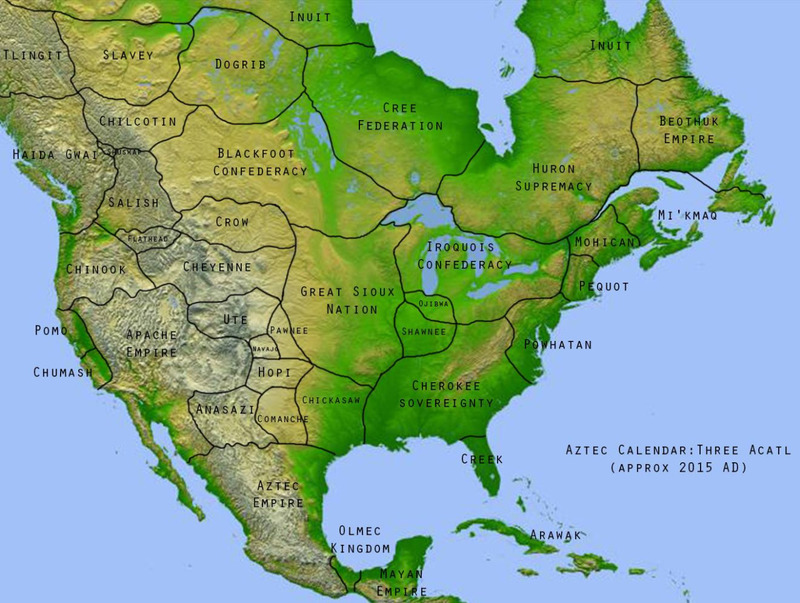 Native Americans were as much warring tribes as Eurpoeans were. And while they would not have had western diseases to kill them off, there is no clear and concise proof that they would have maintained their own “borders”. I believe the reason that there isn’t much discussion about this in school is because most schooling is based on European study, and Native Americans are notorius for “keeping it on the Reservation”. It is hard to teach about something you don’t know and can’t find out about. While that may change, it will also be filled with conjecture and misunderstanding as it will be convoluted with modern issues instead of what happened at the time. Hi, Jonas, thanks for your thoughtful comment. My own point was not only about this particular map and the fate of Native Americans both historically and in the present day, which are both specific to this case, but also about the more general case of how to try to be factual, and what to do when you’ve detected untruths in what you or others have said. I’m no expert in Native American history or culture, nor even in contemporary education, so I welcome others’ opinions (and facts :D) about these issues. But I want to reiterate that the original creator of the map was not trying to make any assertions of accuracy; it was just a background for an alternate-history story. Another factor: The Sioux (and I believe the Apache) didn’t grow strong until they got hold of horses, via Europeans; so their “land” should probably be much smaller. (For the Sioux, in both maps.) And I am fairly sure the Sioux didn’t move into the area they are placed in until they got horses. As for the “correct” map, Sioux is the French name for Nakota (Nakoda)+Lakota+Dakota, whose languages were earlier considered to all be Asiniboine based. Now, aparently, Lakota and Dakota are considered not to be a part of the Asiniboine language family. So it seems incorrect to list Nakota as being Asiniboine and Lakota+Dakota as Sioux, since most (all) other tribes have the European name and not the language. Thank you, thank you. I’m grateful for your integrity, and have corrected my share with a link to your post. Lesson learned, dignity intact. Hi, Keira, thanks so much for taking the time to read my blog post, and especially for correcting your share! The facts is, even though I try to disciplined about checking my sources, I’m sure I also accidentally say and share things that are incorrect. The important thing is that we are open to correction and that we act accordingly, as you’ve done. Thanks for the detailed map, Bruce! The Ojibwe tribe is not even on the map. We are part of the Algonquian language family and we range from the Ohio river valley, through the Great Lakes region and up into Canada. This map comes from a Eurocentric notion and is inaccurate. You have missed many tribes. Hi, Maryanne, you don’t seem to have read my blog post. The whole point was that this was a fictional map mistakenly spread as a real map, and how you can fact-check before spreading information that might be incorrect. A crucial part of this kind of fact-checking and responsible sharing is to read the article that an image is associated with before sharing or commenting.